Wow. It's been a very hot minute since I've published a travel post. A few months ago I visited Missoula, Montana for the second time to visit my brother who goes to school there. And, in a month I will be visiting again (Go Griz!). Before I give you all the low-down on the best vegan restaurants in Missoula, I wanted to share how thankful I am that my parents take me and my siblings on these trips. Obviously, vacationing isn't cheap. But my parents always make sure that we have a fun time together, and I couldn't be more thankful for that. One of my favorite parts of traveling is finding and trying new vegan places. Sadly, Chicago and the suburbs don’t have the most diverse vegan options (Sure, there’s a veggie burger at every restaurant, but I appreciate unique options). When I’ve visited Missoula, I have found a few options that I think are delicious and probably better than what I can find here in Chicago. 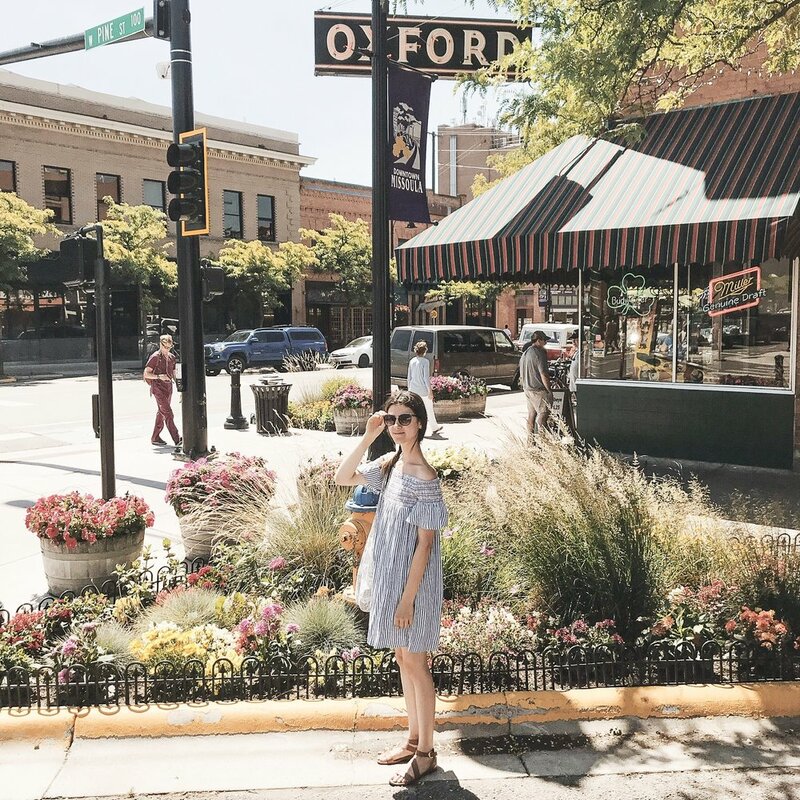 So, without further adieu, here is my Missoula Vegan Travel Guide featuring my top 5 favorite places to dine at in Missoula. Green Source is an organic juice bar and cafe that has an abundance of raw and vegan options. From smoothie bowls and juices, to buddha bowls and raw desserts, Green Source is quite honestly vegan heaven. I first visited Green Source last year when I went to Missoula for the first time, and was super excited to return and dive into their smoothie bowls. Personally, I have only ordered their smoothies and juices. But the rest of my family has tried their buddha bowls (a bowl filled with grains, greens and homemade dressing) and other breakfast items. If you're looking for something refreshing and organic, Green Source is the spot to check out! My Order: The Green Star smoothie bowl. Sometimes I sub the chia seeds and hemp seeds for their homemade granola. I have also had their Cacao Bowl, and I sub the banana slices for fresh strawberries. Price Range: $5-10 for the majority of their food items and juices. Typically, I am not a fan of stir fry/bowl-style restaurants. Typically, they're made using a ton of oils and leave my belly feeling all sorts of ways...and usually not good. When my brother told us that we should try Five On Black, I was hesitant. Not only do these places (Chipotle, I'm looking at you) not always taste the best, but they usually don't have any vegan options that aren't filled with soy (Disclaimer: I have NO problem with soy, but sometimes I want a good veggie option--ya feel?). When I walked into Five On Black and saw that they had SEVERAL vegan options, I was so happy. Not only do they have a Roasted Veggie Bowl option (filled with beets and jicama), but they also have coconut-milk-roasted sweet potatoes, steamed collard greens, and black beans #winning. Another plus? Their prices are so affordable. A small veggie bowl is only $4.50 and their larger bowl are $7.50! For the amount of food that you get, you can't beat this price. And, if you're traveling with non-vegans/vegetarians, there are also meat options. My Order: "Build My Own Bowl" with a base of Crisp Greens with Roasted Vegetables, a side of Steamed Collard Greens (I have also tried the Black Beans! ), topped with Spicy Coconut Milk sauce, and topped with a Lime Wedge, Cilantro, and Chunky Tomato Vinaigrette. Price Range: $4.50-7.95 depending if you get a small/large bowl, or have vegetables vs. meat. The Good Food Store is practically Missoula's version of Whole Foods--only better. Yes, you read this correctly, better than WF (IMO at least). The salad/hot bar at WF can have you dropping well over $10 in no time (especially if you like to load your bowl up with fresh fruit...#storyofmylife), but the GFS's price for their salad/hot bar per pound is only $7.99. That's right folks, almost an entire $3 less than WF! While WF has plenty vegan selections, I love how the GFS has dishes that aren't heavily processed and filled with canola oils. Instead, the GFS uses EVOO, which is a healthier option as far as processed oils go! My favorite part of the GFS is their smoothie bar. If you've ever ordered a smoothie from WF's counter, you would know that they charge anywhere from $7-8 for a smoothie. The GFS's smoothies are only $4. That's right. FOUR. DOLLARS. You can choose from either a pre-made creation, or you can build-your-own smoothie. The build-your-own smoothie includes 5 of any fruit, veggie, nut milk, almond butter, yogurt, etc. plus one "superfood" such as vegan protein powder, spirulina and greens powder. If you're ever in the mood to create your own meal, the Good Food Store is for you! In addition to having their cafe area, they also have a full-fledge grocery store (similarly to WF) that carries super cool brands like Honey Mama's, Brekki and others that all of your favorite Instagrammers are posting about! My Order: I typically get the salad bar and fill my bowl up with greens, sprouts, fresh veggies, beans, and sometimes tempeh if they have it from the hot bar, followed by a drizzle of their homemade vegan ginger dressing. On the side, I always get a smoothie. My go-to smoothie is strawberries, raspberries, blueberries, spinach and coconut milk. For my "superfood," I either do the Mega Greens Powder, spirulina, or vegan protein! The one time I ordered a wrap from the sandwich bar, I ordered a collard green wrap filled with tempeh, hummus, mustard and a ton of veggies! Price Range: $5-10 depending on how much your salad/hot bar weighs! I was hesitant when my brother first told me that he wanted to go to Market on Front for lunch. Typically, markets and cafes never have any decent vegan options beyond just chopped salad, minus the bacon, minus the cheese, minus the dressing…you get the picture. So as I usually do whenever going to a new place to eat, I look up the menu beforehand so I won’t be stressed or worried about finding something to eat—I like to plan what I’m going to order before I actually have to order. But, when we arrived, I was pleasantly surprised to see several vegan options that were even labeled as such! There was a variety of yummy looking menu offerings, from their Missoula Vegan Wrap featuring quinoa, veggies, and a lemon vinaigrette to a simple huckleberry jam sandwich there were interesting and more unique options, along with upgraded basics. In addition to their food offerings, this cafe also had a lot of tasty drink options from their cafe and from their to-go fridge like matcha, kombucha, and tonics. Plus, their prices weren’t too terrible—nothing on the menu was over $10. My Order: The Super Salad, featuring a compilation of spinach, tomatoes, quinoa, red onion, broccoli, celery, carrots, sweet potatoes, dried cranberries and the restaurant’s charred lemon vinaigrette. However, I substituted the sweet potatoes for their roasted beets because beets are one of my favorite root vegetables. The salad was delicious, filling, and only cost $9—what more could you want? Price Range: $3-9.50. The lower end of the range is for their additional protein options and the later amount is for their suped-up salads and sammies. I’m really not a fan of breweries. When my absolute favorite beer-and-burger restaurant, Old Town Pour House, took their homemade veggie burger off their menu and replaced it with the Impossible Burger, I was upset. Soon, most every brewery in this area started offering this burger alternative instead of the ones filled with veggies and beans (my personal favorites). But, I was really happy when we went to Tamarack Brewing in Missoula and I found the veggie burger of my dreams—almost. Tamarack Brewing doesn’t offer many vegan options (actually, none of them are completely vegan, you have to modify their menu offerings), but the ones that are easily modified are delicious! However, I’ve only been to Tamarack Brewing once but was so impressed with their veggie burger that I would definitley go back. Their veggie patty is made from sweet potatoes and chickpeas, and topped with cucumbers and sprouts—doesn’t that sound delicious? Their other can-be-made-vegan options include hummus, pasta, and of course salad. But, what I found the most unique of their options was definitely the house-made veggie patty. My Order: The Garden City Burger without aioli, mozzarella, or the bun. I added a side salad and dumped the salad on my plate and put the burger on top for a “loaded” veggie salad—it’s devine. TIP: if you ever order a salad and there’s a meat protein on it, you can usually always ask to sub the meat for their veggie burger (if one is offered). This way, you not only get a delicious salad, but you also have some protein on it! Price Range: $9-25, depending if you order only an appetizer or a full-on entree. One of my favorite parts of traveling is trying the local vegan food (and of course, taking in all of the beautiful views), and Missoula has yet to disappoint! Have you ever visited Missoula? If so, what was your favorite restaurant? Have you traveled to other places in or outside of the country that had delicious vegan eats? If so, let me know in the comments below!